Ivy Albert’s job is conversation. Working as an interpreter, she helps the hearing impaired by translating things like doctor’s appointments and business meetings to and from American sign language. She was also born with asthma. This story was produced through a partnership with the Idaho Statesman, a daily newspaper in Boise. It’s part of “Breathing Fire,” a series of research reports and journalism features by Climate Central. The work has received support from the Bill Lane Center for the American West at Stanford University. Read the report. Her work requires a lot of talking, something directly impacted by her condition. “When you’re short of breath, it’s really hard to hold a conversation,” she said. Commuting between Boise, where she’s lived for 11 years, and nearby Meridian, she has to travel with the windows down. Her air conditioning doesn’t work; repairing it costs money, money that Albert doesn’t get when she has to give up shifts at work because of her asthma. Dr. John Jeppson, an allergist and immunologist at the Boise Valley Asthma and Allergy Clinic, has observed people’s struggle with smoke firsthand. 2016 was a bad smoke year in Boise, with winds carrying smoke from the Pioneer and Rough fires in the nearby Sawtooth National Forest into the valley. “We had seven or eight people a day coming into the clinic saying, ‘I’m really struggling,’ ” said Jeppson. The problem is the focus of a report released Wednesday by Climate Central, a research and journalism nonprofit. 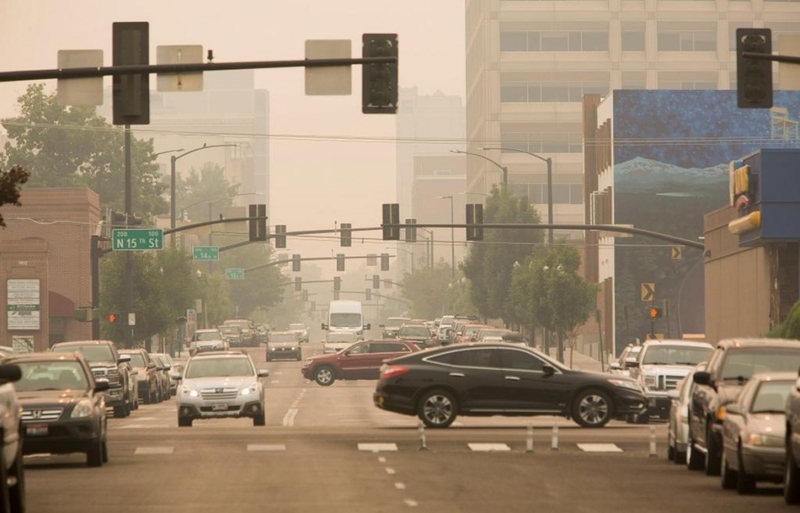 The group examined air quality indices in four states, including Idaho, between 1999 and 2017 and how they are being impacted by wildfire smoke. Prevailing winds from the west and northwest carry smoke from wildfires in California and the Cascades towards Idaho. Combined with local fires and the shape of the Treasure Valley that collects and concentrates smoke, Idaho is an epicenter of smoke activity. In 2016, for instance, there were 48 days in which people were exposed to unhealthy levels of fine particulate pollution due to smoke or other causes. 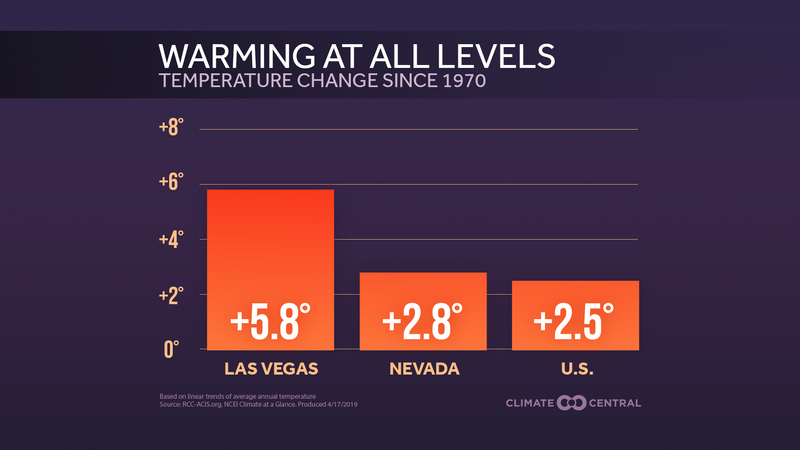 Temperatures are rising as more greenhouse gases from fossil fuels and other industrial sources trap heat. Combined with increasing wildfire activity, the situation is only going to get worse. Smoke is actually a complex mixture of materials, a wispy blend of gases, water vapor, and particulate matter. The scale of these particles is measured in micrometers — a human hair is about 60 micrometers across. Particulate matter larger than 10 micrometers usually doesn’t make it into your lungs. Mucous membranes act like goalies, trapping large particles in your eyes, nose and throat, causing irritation but preventing the particles from advancing. The finest particles, smaller than 2.5 micrometers or PM2.5, represent the biggest health risk of all. A few weeks of high exposure to these particles can lead to health consequences for the following year, said Mickley. They can be inhaled deep into the lungs, said Dr. Patrick Weis at St. Luke’s Idaho Pulmonary Associates Clinic. “Whatever compounds are there, they get ingested by the cells which sets off an inflammation process.” Those chemical compounds get into tissues and the bloodstream, where they can cause a sundry of health issues. It’s not just lung issues that concern Weis. Increased levels of smoke have been linked to cardiovascular events such as heart attack and stroke. Pregnant women and people with diabetes are also at risk. With decreased air quality “you’re under stress, you have higher blood pressure.” You don’t even have to be sick to be at risk, said Weis. Studies show that PM2.5 levels across the Pacific Northwest are intimately connected, so the smoke that’s irritating your lungs could have traveled hundreds of miles, maybe thousands. Smoke from a current wave of wildfires in Siberia is being carried across the Pacific Ocean by the jet stream, affecting the Pacific Northwest and Canada. Along its journey, chemicals in the smoke interact with the atmosphere and sunlight, creating ozone-rich “aged” smoke. This pollutant is also a respiratory irritant, compounding the problem from PM2.5. 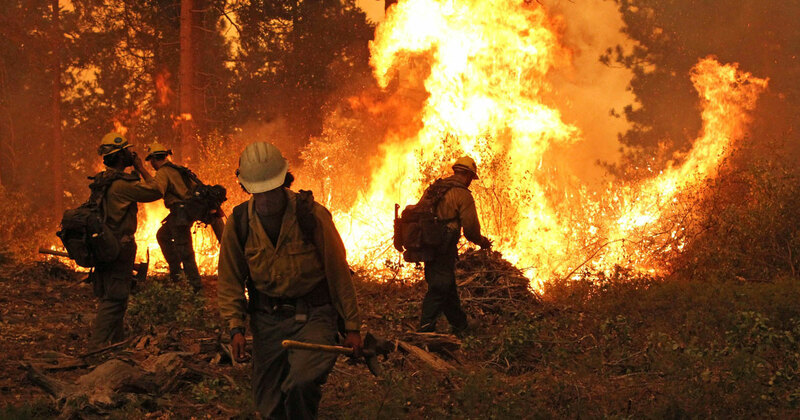 “Fire is certainly on the rise,” said John Abatzoglou, an associate professor of geography at the University of Idaho who advised on the Climate Central report. Compared to an average year from the 1970s, Idaho is now experiencing more than 10 times the number of 1,000-acre-plus fires. It’s not just Idaho, it’s the entire Pacific Northwest, with Oregon experiencing nearly seven times and Washington nearly five times as many. 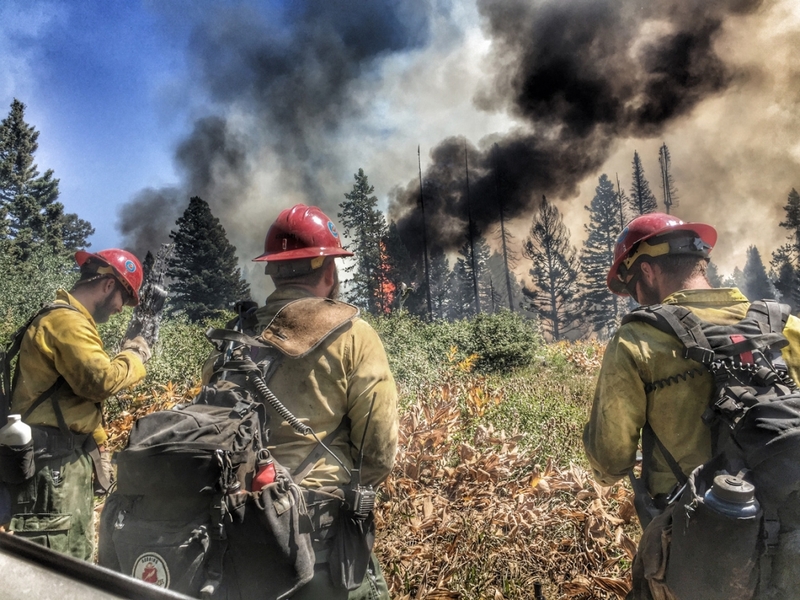 Fire season in the West has typically been between Memorial and Labor days, but this is changing. The average fire season is now 105 days longer than it was in the 1970s. More fire means more smoke. 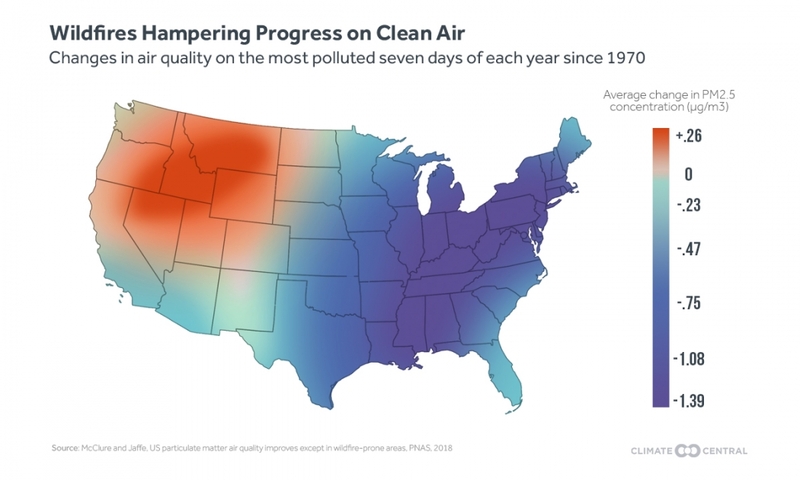 Overall air quality across the nation has improved due to environmental regulation and improved technology. However, the air quality in the West during fire season is getting worse. 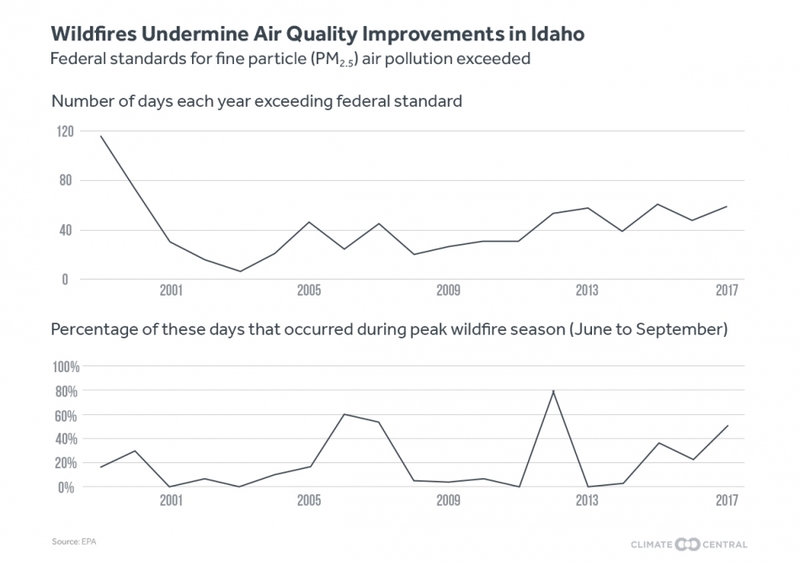 In Idaho, more of the days when the state’s average air quality is deemed unhealthy due to PM2.5 are now happening during peak fire season. Smoke was Ed Delgado’s first exposure to wildfire. He grew up in central Texas, which became inundated with smoke from the Yellowstone wildfires of 1988. Delgado is a meteorologist and was working at a forecast office in Fort Worth at the time. “It was smoky, it was hazy, you could smell it,” he said. Delgado is now the national program manager for Predictive Services, the top meteorologist at the National Interagency Fire Center in Boise. Over his 32-year career, he’s seen drastic changes in the way fire and smoke play out in the West. He’s seen larger fires, and fires that burn longer and throw up more smoke for extended periods of time. This smoke is being carried across the nation and has begun to call attention to the issue. A wildfire is much like a campfire. To successfully build one, you need fuel, you need that fuel to be dry, and you need a way to light it. One fuel playing a major role in the huge range fires of West is cheat grass. 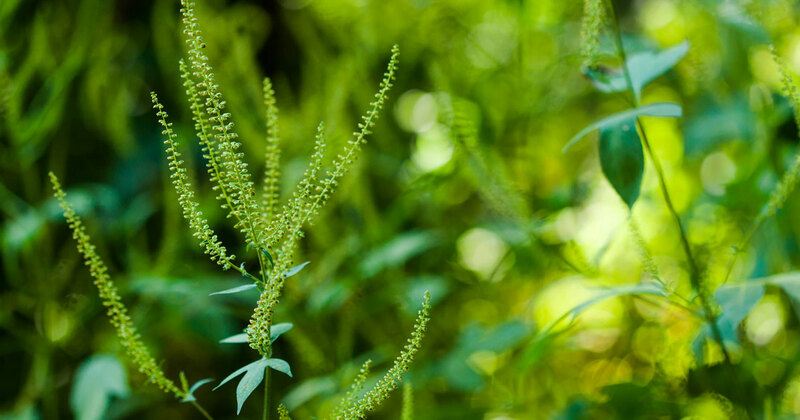 This invasive species covers vast swaths of North America, more than 150,000 square miles in the U.S. alone, almost as much land as the entire state of California. It crowds out native species and dries out quickly as fire season begins, becoming prime fuel. It also burns more efficiently than native plants, said Abatzoglou, consuming almost double the area than native plants under the same conditions. After the fire, it can recover faster than native species, continuing the cycle. 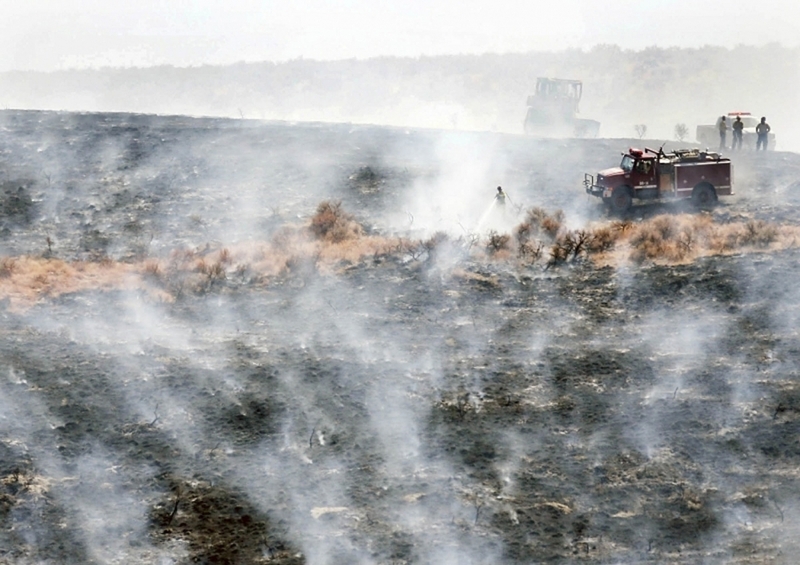 Fire crews battled a grass fire south of Boise this month fueled by invasive cheatgrass. Increasing temperatures and changing rain and snowfall are making a bad situation worse. Climate models predict average temperatures in the Pacific Northwest will climb by between 4.7 and 6.5 degrees by the time people born today are in their 80s. In addition, the regional climate is getting drier. Abatzoglou estimates that about half of this increased aridity seen since 1979 is due to human-caused climate change. These changes in climate harm forests as well. Increased aridity prevents trees from efficiently pulling in moisture. “Rather than try,” said Delgado, “they go dormant as a way to protect themselves.” These dry, dormant trees are just waiting to burn. It’s estimated that humans are responsible for starting 84 percent of all wildfires. Natural climatic variation plays a role as well, amplified by human-induced climate change. Another culprit is build-up of fuels thanks to fire suppression strategies over the years. “We have a debt to pay,” said Abatzoglou of this added fuel load. The whole situation is a self-fueling feedback loop. Fires release greenhouse gases like carbon dioxide into the atmosphere, amplifying climate change. Losing forest and grassland to fire means less biomass to remove those greenhouse gases. “Fire is not going away, and it’s only going to increase,” said Abatzoglou. The Idaho Shakespeare Festival’s outdoor amphitheater is nestled along the Boise River in a natural area full of native plants and animals. Actors on the stage must project their voice to more than 700 people, a feat that considerable lung capacity and control. “These people are in incredible physical shape,” said Hannah Read Newbill, the festival’s marketing director. Late summer of 2017 found Boise inundated with smoke from distant fires, trapped in the Treasure Valley by inversions. “You could taste it,” said Newbill. During the company’s run of “The Hound of the Baskervilles,” the actors started to feel it. The play was “a real physical performance” according to Newbill, requiring even more from the actors than normal. Concerns about the smoke spurred talk of moving the play inside, but the situation improved. Inversions are a common occurrence, concentrating pollutants and their health effects. Jacob Wolf, a meteorologist at the Idaho Department of Environmental Quality, was hired to monitor inversions and update air quality reports for the state. As the sun sets, said Wolf, the smoke from surrounding fires drains down into the lower elevations. “It’s going to behave a lot like water,” he said. The dryness of the air in Idaho and other parts of the Pacific Northwest worsen inversions; this air transfers less heat, increasing the chances of smoke concentrating in one area. With distant sources, unfavorable topography and global climate change, what is an Idahoan to do? One technique to reduce smoke levels, of course, is to reduce the amount of fire. Prescribed burning is one important step, said Mark Boyle. As the smoke management program coordinator for the Idaho Department of Environmental Quality, it’s his job think about ways to reduce smoke and issue permits to people who want to burn. Smoke from the Pioneer Fire in 2016 polluted southern Idaho. Jeppson and Weis agree that when the air quality is bad, people need to stay inside as much as possible. “People have to listen to their bodies,” said Weis. Making sure that furnace filters are high quality goes a long way, but without specialized systems, most home furnaces can’t filter out PM2.5 or ozone effectively. There are also mental health issues, like depression, tied to staying indoors for prolonged periods of time. Using in-home HEPA filters is another good choice, but people with respiratory problems should stay away from ionic purifiers. The mechanism these purifiers used to clean the air generates ozone and can compound breathing problems of sensitive individuals. Ivy Albert thinks that awareness is the key: not only of the respiratory issues people like her suffer, but how to responsibly live in wildfire country. People should understand how to avoid causing fires, she said.